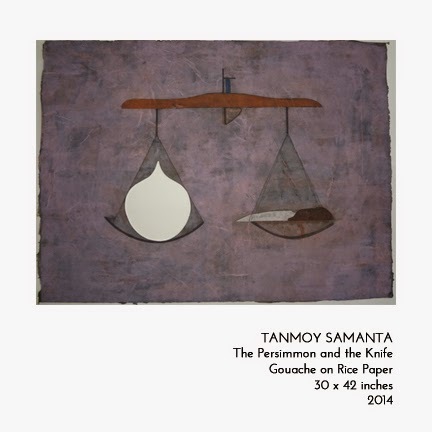 Curated by Ranjit Hoskote, ‘The Shadow Trapper’s Almanac’, is Tanmoy Samanta’s first solo exhibition in Bombay. It features gouache paintings on rice paper and recycled book sculptures, two integral facets of his practice. Samanta’s practice explores notions traditionally associated with sculpture, including “volume and void, relief and surface, container and content.” In Samanta’s delicate works on paper, we find elements of cutout and collage reminiscent of Surrealist and Dada practices as well as a nuanced surety that echoes the style of the miniature. Samanta begins a painting by layering rice paper onto a thicker base, using a series of colours going from dark to light. His book works explore various types of books, including the kitab, the muraqqa, and the laporetto.Each book engages the viewer’s imagination in a unique way. Samanta’s use of desaturated colour and texture evokes a sense of rich nostalgia in the ordinary. According to Hoskote “Tanmoy Samanta’s works, with their combination of exhilaration and menace, formal playfulness and philosophical depth, remind us that art is not an escape from the world, but a route that leads us back, replenished by dream and vision, to the perplexities of the everyday. Tanmoy Samanta (b. 1973) received a BFA and MFA in Painting from Kala Bhavan in Santiniketan in 1996. 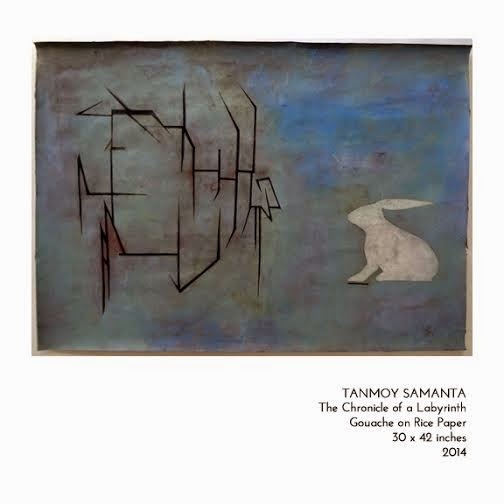 He has been awarded a Pollack Krasner Foundation Award (New York – 2013) and a National Scholarship from the Government of India (1995 – 1997).Samanta, who lives and works in New Delhi, was raised in an environment rich in literary and artistic experience. Both his parents were participants in the Bengali ‘little magazine’ movement; he grew up to savour the Tagorean ethos of Santiniketan, developing his practice there and later in the collegial setting of the Kanoria Arts Centre, Ahmedabad. Early in his career, he taught at Rajghat, the Krishnamurti Foundation’s school in Varanasi. TARQ, Sanskrit for "discussion, abstract reasoning, logic and cause", is a new contemporary art gallery in Mumbai dedicated to growing a conversation around art from a diverse range of contexts. Our focus is on maintaining close relationships with our artists and patrons, and to encourage thoughtful acquisitions of art. We plan on showing art that is process driven and provoking. Apart from our regular shows, we are also committed to building an educational structure that enables the art community to grow through thought, discussion and action.Located at Dhanraj Mahal, one of Mumbai's iconic Art Deco buildings a stone's throw away from the Gateway of India, TARQ is spread over two floors and 3000 sq. ft.